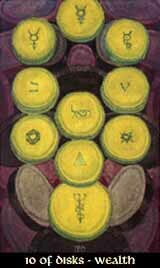 With the Ten of Disks the element of Earth has reached Malkuth, the final place of active manifestation - Assiah meets Assiah - and the Disks are in their very own homeworld. Therefore, the Ten of Disks are at the point where their richest potentials unfold, getting settled and staid, realizing the complete amount of material gain. Also, the Ten of Disks is the very last of the numbered cards, representing the completion of work, the full circle of Earth. On the dark side, the Ten of Disks become fat, lazy, blinded by wealth and even greedy for more, then being busy with grabbing together more riches. When richdom gets big, it needs a ventile to not become dull, a concentration on science or emotion to not get buried in nothing but earth.